This interchangeable insert can be used with the Sole Mate, Elite Body Brush or the Soapy Soles Elite. 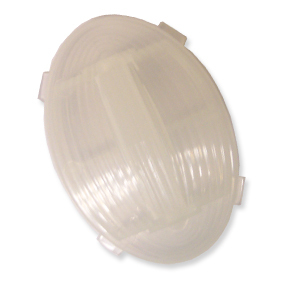 Simply pop out your current insert to quickly install this one with ease. These swapable inserts add to the versatility and value of your existing soapy soles product. There are three different replacement inserts available. Each one is entirely different from the rest, and designed for a specific job. Also available are the pumice insert and the bar soap insert. This soap dispenser insert is perfect for applying your favorite liquid soap or body wash when cleaning your feet. Just fill up the reservoir, put on the top and install. Roll your foot over it to get the right amount of soap applied to your feet each and every time. This is a fast, hands-free method of applying soap to your feet. Simply install in your Sole Mate, Elite Body Brush or Soapy Soles Elite, suction to the floor if necessary, and prepare yourself for an incredibly easy and/or hands-free way to take care of your feet. Order Yours Today! Liquid Soap Dispenser Insert - A convenient little device to make taking care of your feet easy. Get a spa quality foot treatment right in your own shower. Order Today! Would this work for body lotion as well? Yes. That should work as long as the lotion is the right consistency. If it is too thick, it may not dispense.